This article first appeared in Kentucky Teacher, a publication of the Kentucky Department of Education. This isn’t the way Girls Who Code was supposed to work. 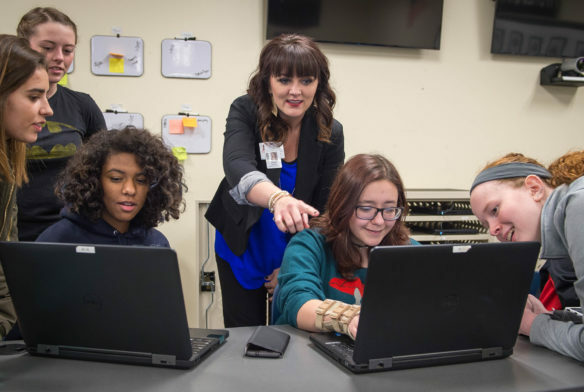 It’s working just fine, however, at the Hardin County Early College and Career Center, where Brooke Whitlow is helping a room full of girls gain a better understanding of computer science. Whitlow has adapted a curriculum designed for after-school programs as an entry-level class for freshman and sophomore girls interested in learning how to code. Whitlow, the instructional technology coordinator for Hardin County schools, liked the model of Girls Who Code. The nonprofit, which is dedicated to closing the gender gap in technology, offers free programs that allow girls in grades 6-12 to learn about computer science and exposes them to the possibilities of a career in technology. But after she tried to find a way to bring it to her district, Early College and Career Center Principal Dan Robbins raised the possibility of teaching the curriculum in a classroom setting. Laura Raganas, a digital learning coach and the Imagine Academy program manager at the Kentucky Department of Education, said operating the club as a class is something that hadn’t been tried by anyone in Kentucky. The group has clubs in all 50 states, including 14 clubs currently registered in Kentucky. Kentucky’s first Girls Who Code club launched less than two years ago at Murray State University and was offered to students from the Calloway County and Murray Independent districts. “They were very pleased with it, and we decided that we would like to champion the program and get it out to more schools in Kentucky,” Raganas said. KDE decided to do that through the Student Technology Leadership Program (STLP), which has more than 500 schools participating in project-based learning activities that utilize technology. Most of the 14 Girls Who Code chapters in Kentucky are clubs–or are trying to be. Many of them are run within schools and districts, but some are run by outside entities– such as Murray State and the Boyle County Public Library–that can offer the curriculum to girls from multiple schools. There have been some bumps in the road for schools and districts that have tried to establish Girls Who Code clubs. Nikkol Bauer set up a club at Henry County Middle School that meets once a month during the school’s club day. There are 31 students in the club–mostly boys, who are allowed to participate in the program–but there isn’t much time for them to work. Other schools that have tried to get after-school clubs off the ground have run into problems with transportation and schedule conflicts. Bauer said there is value for schools that can get Girls Who Code rolling. “I think they’ve got a pretty decent curriculum set up in terms of skill level,” she said. The curriculum is designed for students with a wide range of computer science experience. There are activities for girls with no experience and activities that introduce college-level concepts. Participants learn about the computer science concepts that form the basis for all programming languages. The students also serve their communities through an impact project in which they use computer science to solve a problem relevant to the club and the community. In Hardin County, Whitlow and Robbins are using Girls Who Code as a means of getting girls into the district’s information technology program. “In the four years the center has been open, only one female has completed the IT pathway,” Whitlow said. “We wanted to do what we could to increase female participation and give them a sense of empowerment as well. Alyssa Baxter, a freshman at North Hardin High School, said she likes having the girls-only coding class. “I think it just makes it really encouraging, because there are people around you who understand just how hard it is to get into the field and be taken seriously as a woman in coding. You have a big support group behind you that’s rooting for you,” said Jillian Sanchez, a sophomore at Central Hardin High School. Whitlow recruited her students by sending letters to about 50 girls, some of whom she had taught when she worked at a middle school in the district. Fifteen girls from the three Hardin County high schools are in the class, she said, and that’s a good number from which to grow. Whitlow had to pass a facilitator exam to lead the Girls Who Code program, and she said that was a difficult hurdle. “That’s my biggest advice to somebody starting off with a club. Don’t take that exam lightly, especially if you’ve never been a computer science teacher before,” she said. Her class provides the first credit in a four-credit pathway that next year will include a second course based on the Girls Who Code curriculum. The pathway will culminate in a class in which students can specialize in a specific programming language. Girls Who Code is open to students in grades 6-12. The Kentucky Department of Education has partnered with Girls Who Code to bring its curriculum to middle school and high school clubs or classes. · A faculty member who will be responsible for leading the club and communicating with Girls Who Code. Click here for flyers that can help you spread the word about Girls Who Code at your school.